Welcome to the Nemesis Web Page! Searching the WEB for information? David Jones - auther of this amazing web page! Place of Birth: Camarthen, Wales. Current address: Apt 5-306, 4152 Lexington Ave., Shoreview, Minasota, 55126, USA. The University of Wales, Cardiff is one of Britain's major centres of higher education, and was my chosen place of study for my BSc Computer Science degree. Its origins are in the merger of two distinguished university colleges, whose history of service and achievement date from 1883. Main university building, Cardiff University, Wales. Cardiff's standing as a leading university institution is indicated by the breadth and strength of its international links. Formal and informal links exist with major universities on virtually every continent, providing opportunities for collaborative research and the exchange of staff and students. Cardiff has over 13000 students, including more than 3000 postgraduates, drawn from throughout the UK and overseas. Cardiff's size, staffing and resources mean that it contains a wealth of expertise; and expertise that is reflected in the over 500 undergraduate and postgraduate degree schemes that we offer. Many of Cardiff's degree schemes have significant vocational and professional content, designed to satisfy the needs of industry, commerce and government for highly qualified graduates. It is the national centre for many professional courses, including Architecture, Optometry and Pharmacy. The University is committed to gaining recognition as one of Britain's top research universities. A large number of its research units are conducting research of international quality, according to the recent Government assessment, earning them some of the highest research ratings in Britain. The University attracts an increasing number of research grants and contracts, annually in excess of £13 million. The University is located in and around the Portland-stone buildings, parks and tree-lined avenues that form Cardiff's magnificent civic centre. It has the advantage of being just a few minutes walk away from the city centre. Academic departments, libraries, residences and social and sports facilites are situated within a short walk of each other, on a campus that is compact and well maintained. The University has one of the most up-to-date library services in the UK. The latest advances in information technology are used to support research and teaching. With almost a million volumes and 9,000 different journal titles it is a large resource and still growing. The Library service is organised into a network of ten libraries, with each being strategically situated close to the department it serves, to maximise convenience for users. The libraries are all linked through a powerful computer system, making it simple to find books and journals as well as to reserver books and check details of borrowing. Students also benefit from excellent computing facilities, which are being continously expanded and enhanced. The Department of Computer Science is housed in the University's Queen's Buildings at Newport Rd. The Computing Centre, Newport provides computing facilities to support the teaching and research carried out at the University of Wales, Cardiff (UWC). Liverpool Football Club was founded in 1892 by the then owner of Anfield, John Houlding. Started with 10 Scotsmen in the team, it slowly grew to be a force that everyone love to hate and has a record that none could match. Liverpool won their first trophy in the 2nd division in the 1893-94 season. But the first real major honours came only in 1900-01 when they won the then 1st division title with the Tom Watson in charge. Liverpool experience some ups and down after that and it was only when the legendary Bill Shankly, who came into reign in 1959, that Liverpool's power begin to established. Having taken Liverpool back to the top in 1962, it was no turning back for Liverpool. With the championship win in 1963-64, he went on to add the first Cup victory for Liverpool in 1965 in the form of the FA Cup. But the man, who brought in people like Ray Clemence, Roger Hunt and Kevin Keegan, just to name a few, was not satisfied and only after another 2 Championship titles, another FA Cup and the UEFA Cup, another first for Liverpool, were in the bag that he decided that it was enough and call it a day in 1974. His successor, Bob Paisley, has every intention to keep the proud records of Liverpool and he did just that. In a space of 11 years, he captured the European Cup, UEFA Cup, European Super Cup, League Cup and never dropped below 2nd place in the league except for the 1980-81 season. It is through him that Kenny Dalglish started his career in Anfield. In the 1983-84 season, Liverpool won a rare treble with Joe Fagan, one of Shankly's 'Bootroom' staff, before Kenny Dalglish was appointed the Player-Manager of the club. A first in Liverpool's history. Dalglish demonstrated his knowledge of the game by winning the doubles in 1986 before his shock resignation in 1991. The man who took over from him was his fellow team-mates during the Paisley era. Graeme Souness, who was managing in Scotland before coming over. High hopes was placed on him to continue Liverpool's reign but it prove to be Liverpool's greatest nightmare since the Heysel and Hillsborough disasters. 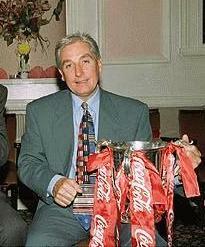 It was at this time that Liverpool decided to bring in Roy Evans, who is already a bootroom staff since the Shankly's days. His experience in working with the many great managers on Liverpool ensure that Liverpool goes back on the right track. In his first full season, Liverpool brought the League cup back to their trophy room and is looking forward for their 19th League Championship and the cup they never won, the Cups Winner Cup. Surely, glorious days for Liverpool are certain to come again. 1) The Kop was built in 1906 and named after Spion Kop, a hill in Natal where a Merseyside regiment suffered heavy losses on 24 January 1900 in a bloody battle in the Boer War. Three hundred died in a vain attempt to lift the siege of Ladysmith, many of them Liverpool lads. Ernest Edwards, sports editor of the Liverpool Post and Echo, hit on the idea of naming the cinder banking after the hilltop. 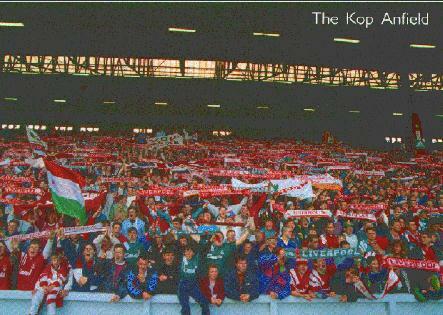 2) The name Spion Kop is Afrikaans for "vantage point". There are Kops on at least a dozen other English grounds, but none are as famed as Anfield. 4) The Kop's famous flagpole on the corner with Kemlyn Road was originally the top mast of the "Great Eastern", one of the first iron ships whose maiden voyage was in 1860. 5) When Leeds' goalkeeper Gary Sprake, threw the ball into his own net in a match at Liverpool, the Kop spontaneously sang a chorus of "Careless Hands". But they were also generous to opposing keepers who had performed well, particularly in the ovation they gave to Pat Jennings who saved two penalties for Spurs at the Kop end. 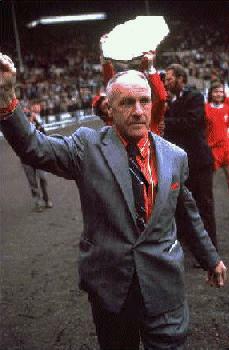 6) As manager, Bill Shankly went on the Kop one week, disguised in a cap and muffler. When asked what it was like he replied: "It's a bit too crowded for me". 7) "You'll Never Walk Alone" has been the unofficial anthem of the Kop since Liverpool favourites Gerry and the Pacemakers took it to the top of the charts in the 1960's. 8) The singing of the Koppites became famous in the early Sixties in the wake of the Beatles' success. 9) Kevin Keegan became the Kop's favourite son after signing from Scunthorpe. But his decision to leave to join Hamburg was regarded as an act of treachery. 10) Emlyn Hughes was a particular favourite of the Kop fans and his barnstorming runs down the left flank after he arrived from Blackpool inspired the nickname "Crazy Horse". A few of the current contacts in my life, firsts there's Rob (my brother) with a very poor attempt at a web page! Then there's Mark - a friend who we've been with pretty much through our childhood and into the workplace. Then last but not least is the company I work for Control Data. My brother Back to Rob's web page - the guy's a complete MUSH addict! GEOCITIES Provides us mortals with web building tools to create free Home Pages and free email accounts! SHAREWARE.COM A searchable shareware archive, shareware.com offers easy access to over 190,000 shareware and demo programs. MTV, MUSIC TELEVISION MTV, the folks who brought you music videos, is now on the Net! HOLLYWOOD, find information from ALL the latest films! CARDIFF UNIVERSITY, UK university where I earned my degree, strong on research, has many international contacts for it's projects. Searching for information - try Yahoo, or InfoSeek Net Search. OR try the Lycos search engine here!